Red and green should always be seen, don’t you think? This zesty vegetarian salad is low fat, low budget and can be thrown together with a handful of pantry and freezer staples. This isn’t my first foray into pasta salads, first there was this Kale and Basil Pesto Salad (oh my word, that pesto!) 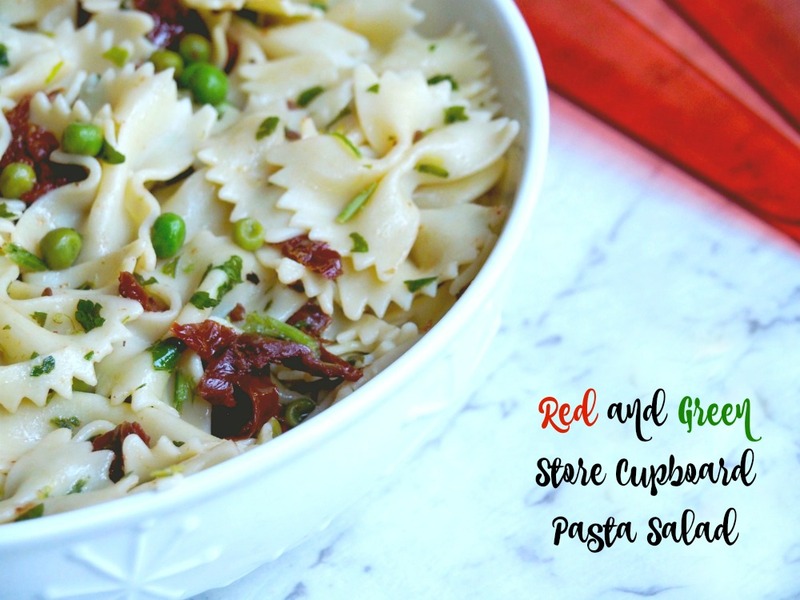 and then there was this Easy Antipasto Pasta Salad and yes, if you haven’t guessed already, I like my pasta salads simple to make and delicious to eat. Like so many of my recipes, this salad came about quite by accident. I was making lunch to serve at the Asylum Seekers Centre and I wanted to make one extra dish but I didn’t want to go out to buy ingredients because I’d been to the supermarket so often that I was on the verge of taking out time share there. I like to think I shop like a French person buying the fresh ingredients I need every day, but the truth is, I shop like a forgetful person because I shop every day to buy the things I forget from the day before! But enough of my shopping habits, let’s get back to the salad! Not only is this salad delicious and colourful, it takes minutes to throw together and requires just a few ingredients that can be easily found in the freezer and the pantry. 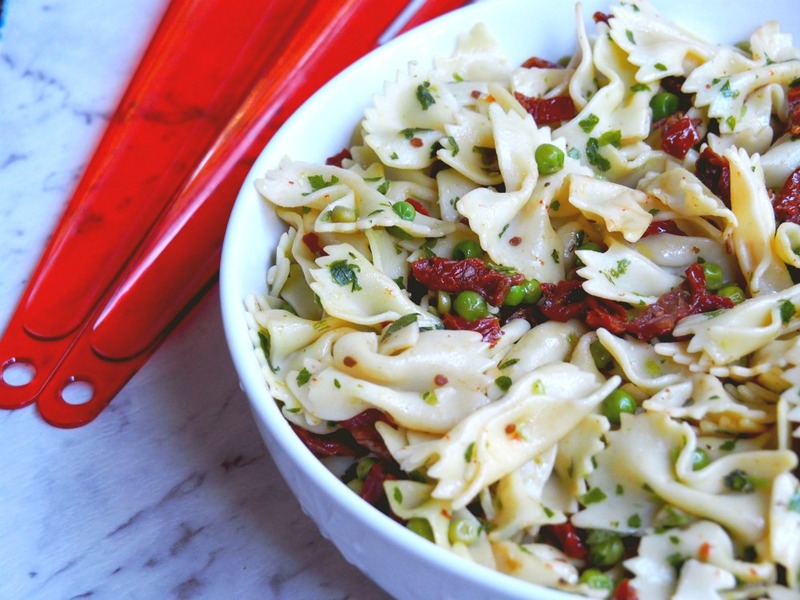 Of course, this recipe is very versatile too, if you’re eating meat, you can pimp this up with ham, bacon or salami and if you’re vegetarian, you can swap out the peas and sundried tomatoes and use fresh avocado and cherry tomatoes instead. I think it would make a cracking Christmas salad because it can be made ahead, it will feed (and more importantly please) a crowd and the colours are totally on point. Don’t you agree? Incidentally, left overs go great in a lunch box and this salad will be keep for three or four days in the fridge. 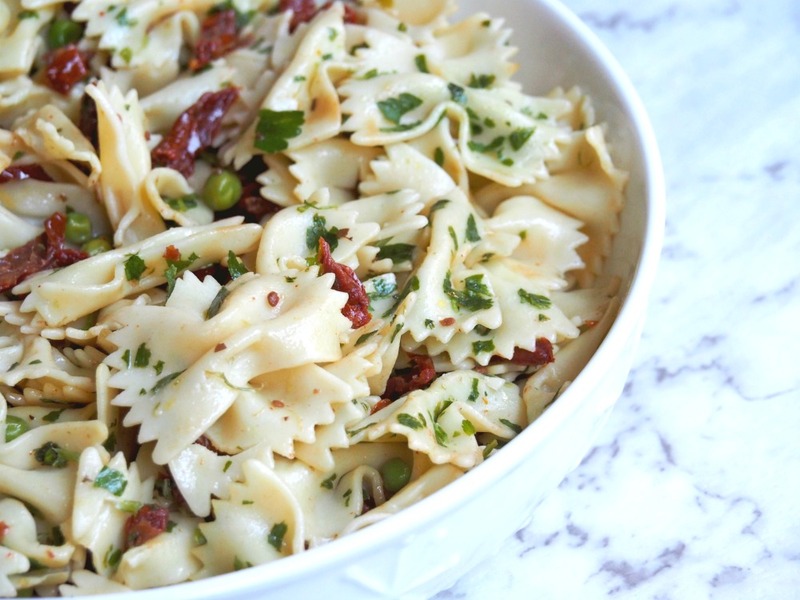 If it looks a bit dry, just drizzle with olive oil to loosen the pasta. I had some lemon infused olive oil which took the flavour to the next level. How often do you go to the supermarket? What’s your go-to dish when you have to bring a plate? 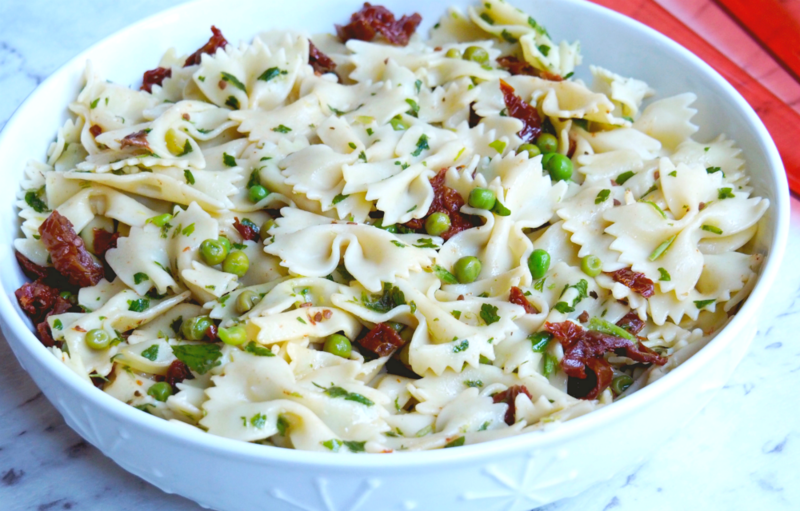 Cook the pasta according to the packet instructions, adding the peas for the final 2 minutes of the cooking time. Drain, rinse with cold water and then rinse and drain again. Tip into a large bowl and add all the other ingredients. Season really well and mix to combine.